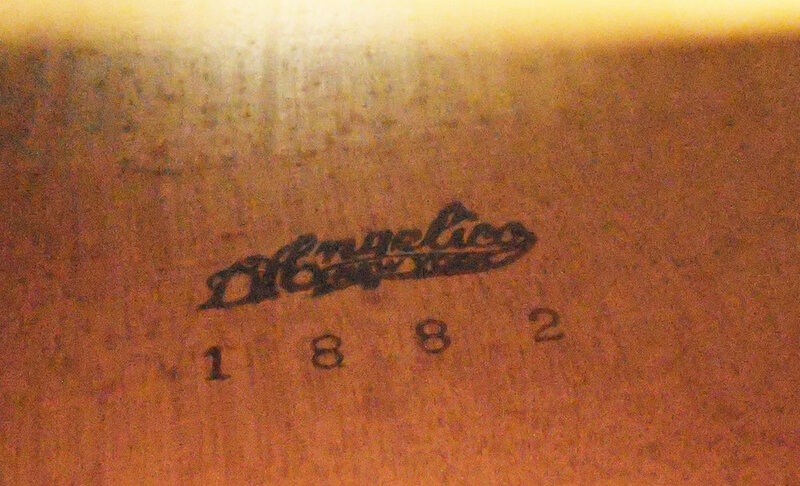 The "NEW YORKER" model guitar was the flagship of John D'Angelico's product line. This particular, beautiful 18-inch example is documented in the D'Angelico ledger book #2, which shows it being shipped or completed on 11-21, 1951 for Mr. Ray Gogarty. Ray was a well known and successful New York based musician, who was very highly regarded as a player, arranger and teacher in his day. Ray passed on in his sleep in 2007 at 89 years old, and purportedly had done a gig earlier that evening! It is known that Ray was not only a D'Angelico customer, but that he and John were also friends. In fact, Ray is credited with taking several photographs that appear in published books about D'angelico guitars. Ray was not only a credited photographer, but he is also pictured in several photos that were taken at John's Workshop too. Ray is also known as one of the teachers that taught and influenced musician, singer, and performer extraordinaire Brian Setzer, whom he credits as an instructor he sought out early on. 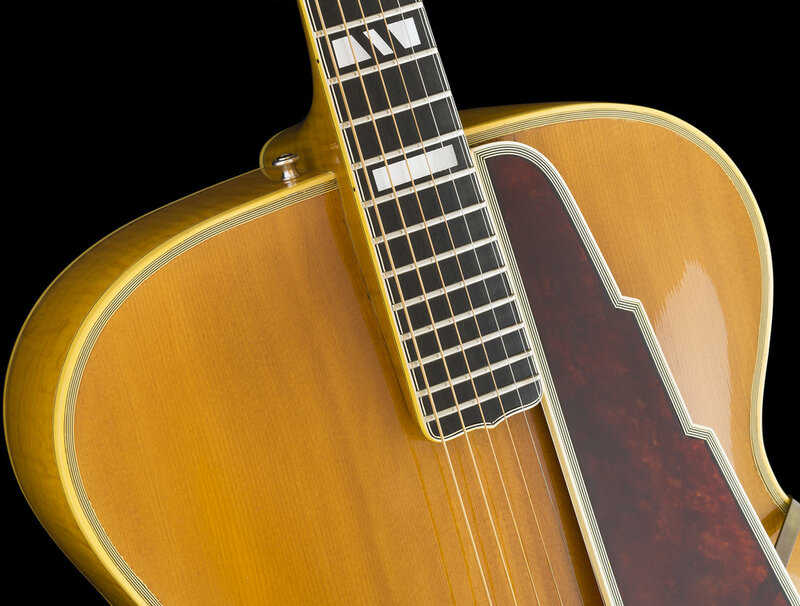 The fancy "New Yorker" model dates back to John's early days of guitar building, first appearing in the mid-1930's and it is believed that there were about 300 New Yorker models built during his lifetime in both cutaway and non-cutaway versions. 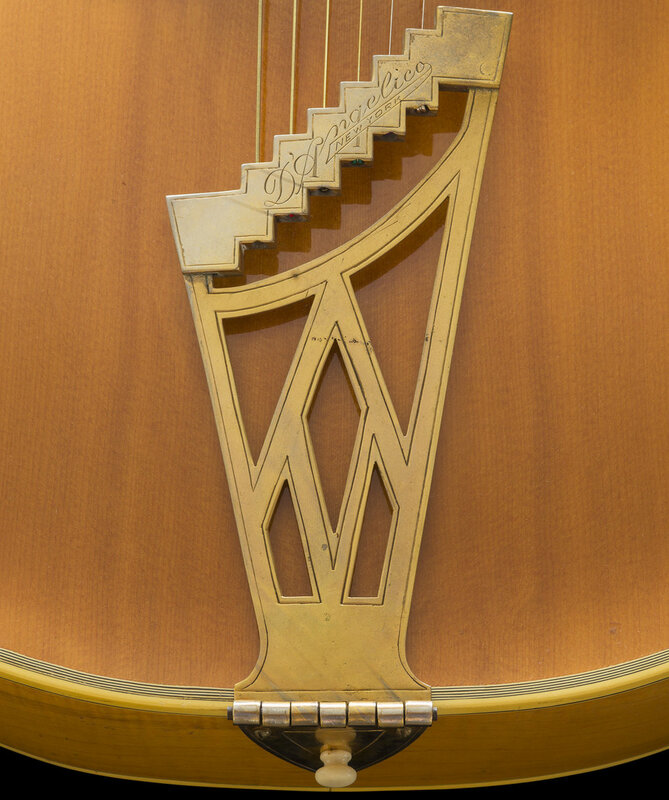 I very much enjoy looking at this instrument. As my large and clear photographs show, the guitar is both beautiful and majestic in my opinion. I consider it a "work of art" by a master. Coincidentally, the guitar has been published and was included in a book that a friend, Charles Dellavalle organized and co-wrote, and one that I proudly contributed many of my private guitar collection photographs too, and the New Yorker was chosen as the COVER. All that being said, there is an issue to disclose. The guitar was initially consigned to my Los Angeles Vintage guitar store sometime around 1990, and I went to work and found a buyer for it. This was when trouble ensued. I packed and shipped the guitar to a prospective buyer and sadly, during transport, the headstock was cracked and damaged. Ultimately the guitar was returned to me and I had to decide how best to proceed. After reviews and discussions with luthiers that I know, it was decided that the best course of action would be to re-craft just the maple neck but save and reinstall all of the original parts, which included the fingerboard, nut, headstock veneer, skyscraper truss-rod cover, and tuners. 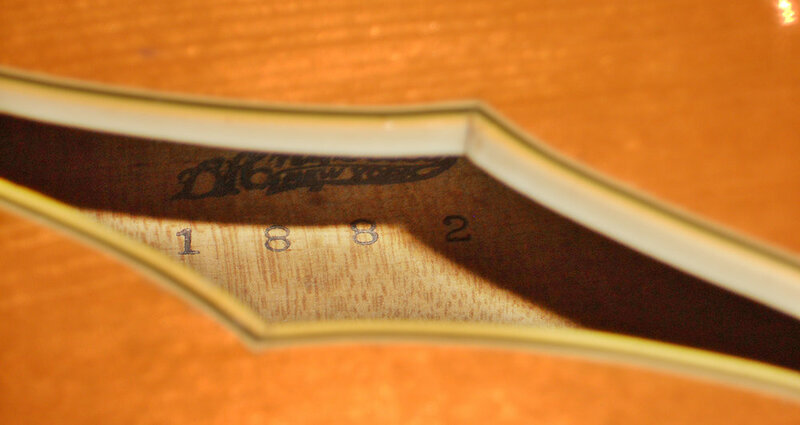 The original Maple neck happens to be thin around the nut area as there is more fingerboard thickness than neck at that junction, which is where the damage occurred. It was decided that trying to repair it would be inadequate due to the thinness of the maple, and I felt the guitar deserved a more "permanent" repair. Luckily, Mark Lacey was available to do the restoration. 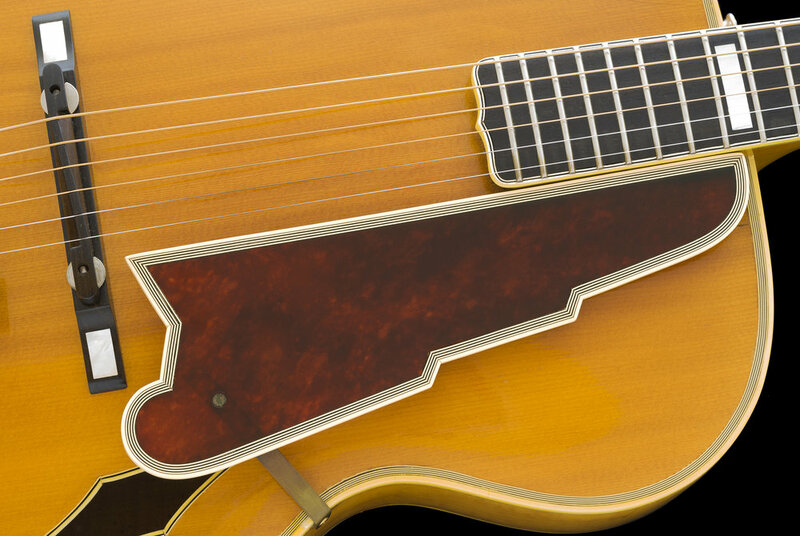 Mark is one of the premier archtop builders in the U.S. and is well-known for crafting his own exquisite and beautiful, hand-made archtop guitars (which were D'angelico influenced). Mark was a logical choice for the job and was also a neighbor who had a local shop at the time called the "Guitar Garage," located just around the corner from my Hollywood store. Today, Lacey Guitars is located in Nashville where he continues his fine craft (Thank You again Mark). Once the work on the New Yorker was completed, it turned out so well, and the guitar looked so wonderful that I decided to keep this magnificent instrument and it has been in my possession ever since. I also saved and still have the original, albeit damaged neck that Mark skillfully removed. The CASE is a not the typical one usually seen with these guitars. This is a heavy duty, tweed hardshell archtop case that I received with the guitar and it resembles cases that I have had with some large Gretsch guitars from the 1950's. 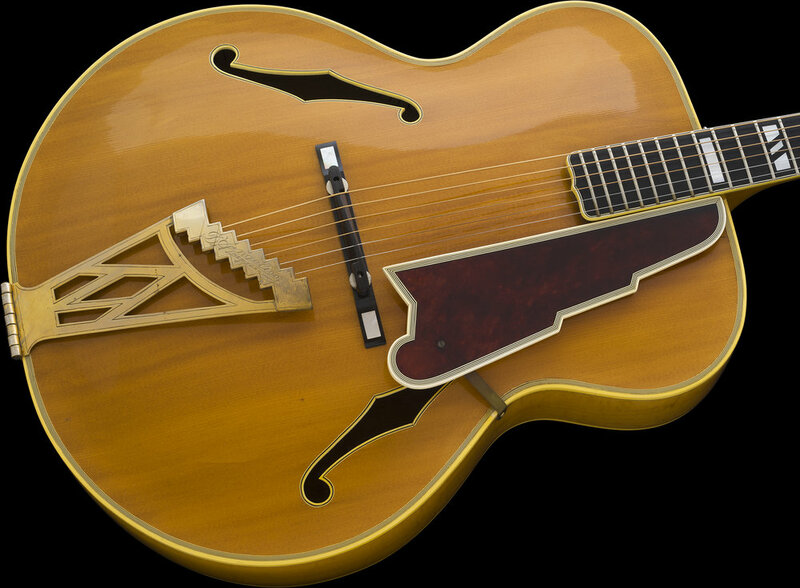 Interestingly, it has been told to me by Brian Setzer, who fondly remembers seeing 2 D'Angelico's at Rays home during lessons, that he clearly recalls both of Ray's DA's being in "Tweed" cases. According to Brian's recollections and the ledger books, in 1957, Ray also commissioned John to make an Excel model for him, which was purportedly a Blonde cutaway guitar, so Ray had 2 of the master's creations, and according to Brian, he kept both in Tweed cases. The guitar has just received a set of D'addario 11-52, Bronze strings. The guitar is now 67 years old and it was nearly 30 years ago that it came into my Hollywood store and I have had it since. This guitar is very substantial feeling and structurally solid. It plays very nicely and the sounds it makes vary depending on the person holding it. I will say though, at the hands of some very talented artists and friends that I have heard this guitar sound amazing. 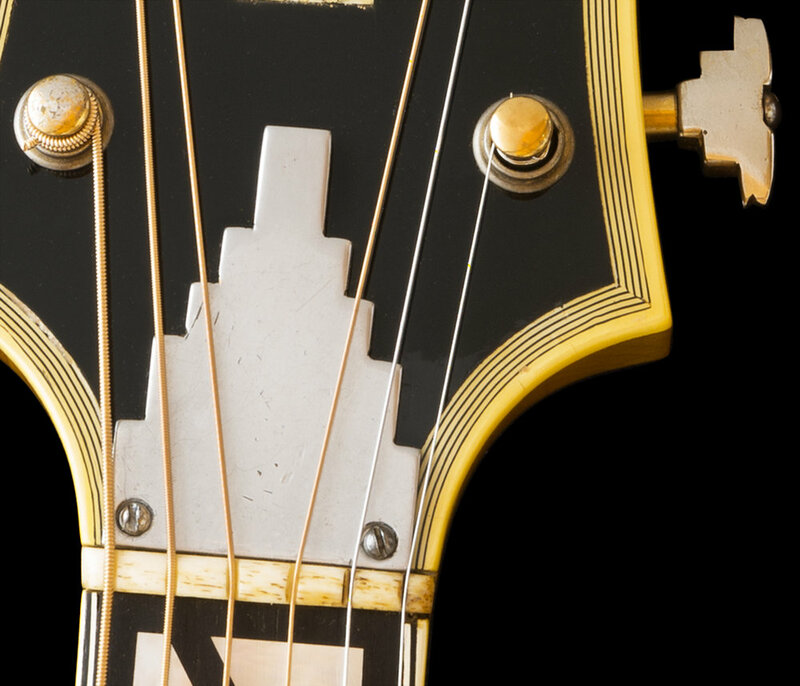 This documented and book-published guitar has some interesting and fun history and its beauty and condition are apparent in the photographs. If you might also be enamored with it or have any questions, kindly do inquire. Weight: 7 lbs. 4.4 oz. Case: Mid 1950's Tweed Archtop case.